On our recent trip to London, we did more looking than buying (the exchange rate is terrible!). My friends introduced me to the Very Bradley of London... Cath Kidston. Her stores have the cutest wares made from darling fabrics. I searched 3 stores until I found her signature London design on a tea towel. 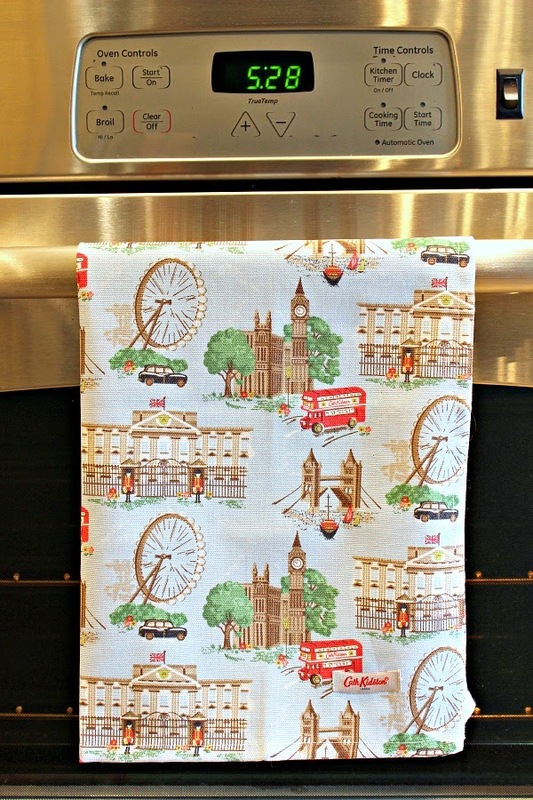 I don't normally keep a towel on my oven or dishwasher handles, but after seeing this one I wanted to see those wonderful London icons and remember our trip every day. We also made the obligatory trip to Harrod's and left with a small souvenir. Charity Shops (thrift stores - I like the name Charity Shop so much better!) are easy to find mixed right in with high end stores almost every way you turn. So of course, that's where I had fun digging! After touring Windsor Castle, we spent some time shopping in the little town. I found a framed print of the castle that I couldn't resist (the frame was trash, just bought it for the pic!). I love the colors and the swans on the Thames River. I plan to frame it and include it in a gallery wall in our bedroom. 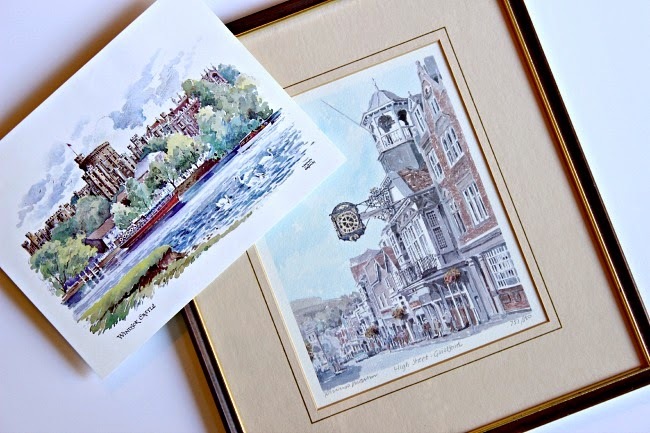 The other picture is a watercolor of a little English town. My sweet friend sent it home with me. Here's a few of the real swans. One of them tried to eat the diamond in my wedding ring! ;) They're protected by the Queen and along a section of the Thames in Windsor they are counted every year. I also found another treasure at the Charity Shop in Windsor. 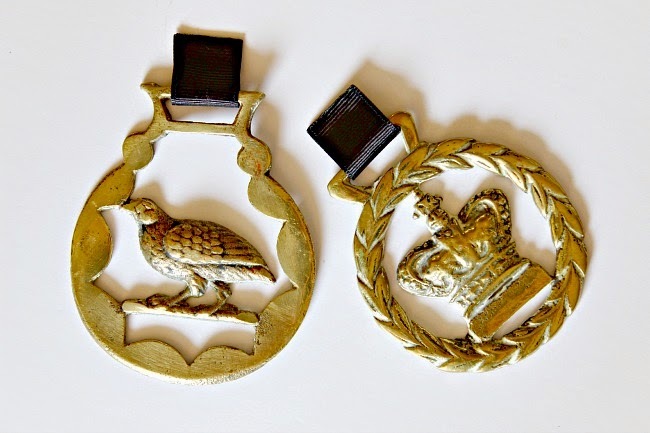 These brass saddle ornaments were everywhere. There are limitless designs, so I dug through and found this one with a quail (at least I think it's a quail). Quail are special to us, since my husband serves on staff at Quail Springs Baptist Church and they represent our precious church family. Then, on our last morning there, we stopped at another Charity Shop on the way to the airport and I found this one with a crown! We did see The Queen while we were there, after all (more details on that in a future post). Both were perfect. I wanted to display the ornaments, so I grabbed a frame from my stash, an old piece of mat board, and some fabric and ribbon. After cutting the fabric to size and gluing it along the edges to the matboard, I looped the ribbon through the top of the ornaments, and then hot glued it to the fabric inset. I used a few drops of hot glue to secure the board in the frame, and called it done! Now these are in a prominent place in our living room, and every time we see it a flood of memories from our wonderful trip returns. I find myself being more and more selective of what I choose to purchase when we travel. 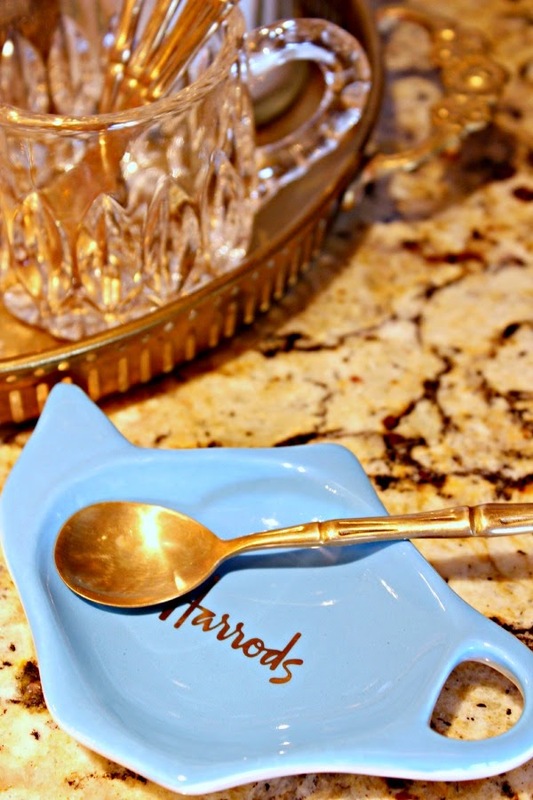 What are your favorite souvenirs to shop for? 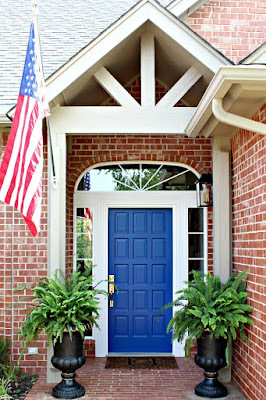 Tour of Nell Hill's in Kansas City - Home Decor Galore! 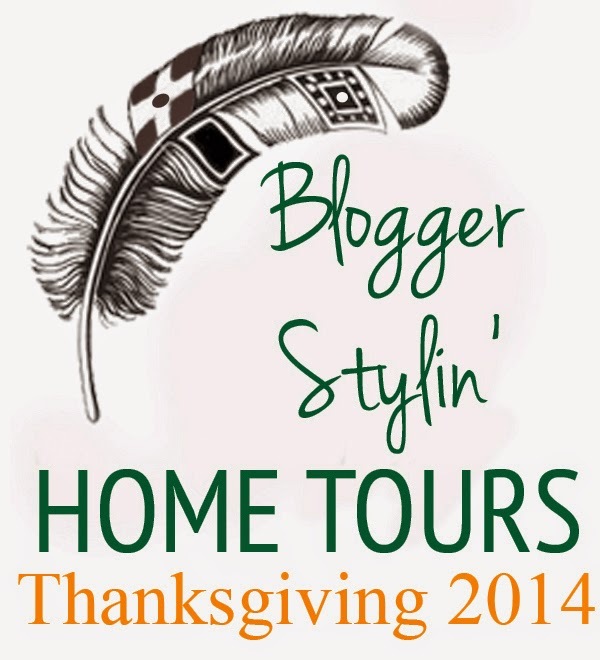 I'm so excited... Wednesday I'll be here with another Blogger Stylin' Home Tour: Thanksgiving Edition! This week, a group of bloggers have teamed up to give you some fabulous table setting ideas for the big day. The tour starts today at The White Buffalo Styling Company! love them all- that swan image is beautiful!!! Great choices! I usually get a piece of artwork. Love how you displayed the ornaments! And I've got a few Cath Kitson things as well thanks to a smart friend who lived in London. Love her style! Love your finds and about Cath Kidston, I've been a fan for years! 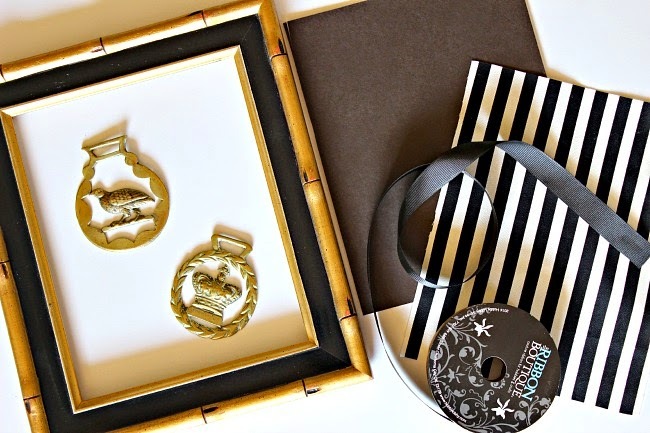 Love how you framed your charity store finds Jennifer! Don't you just enjoy seeing your souvenirs around the house ?! 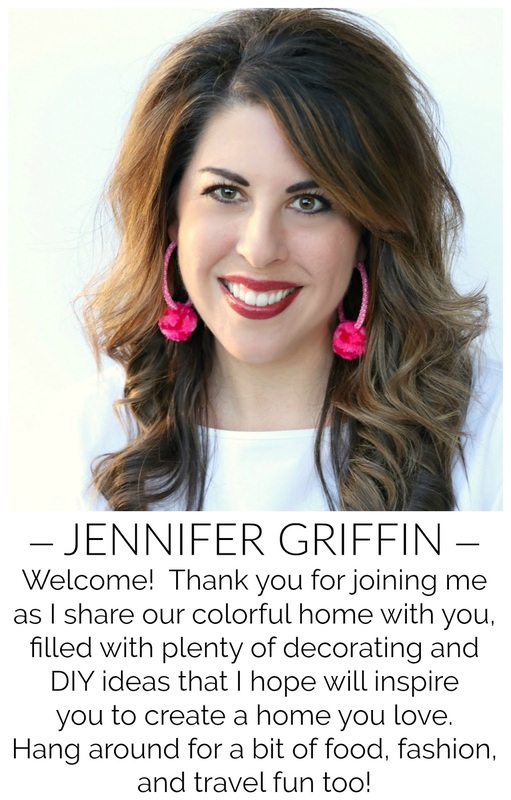 Jennifer I love how you displayed your treasures!! 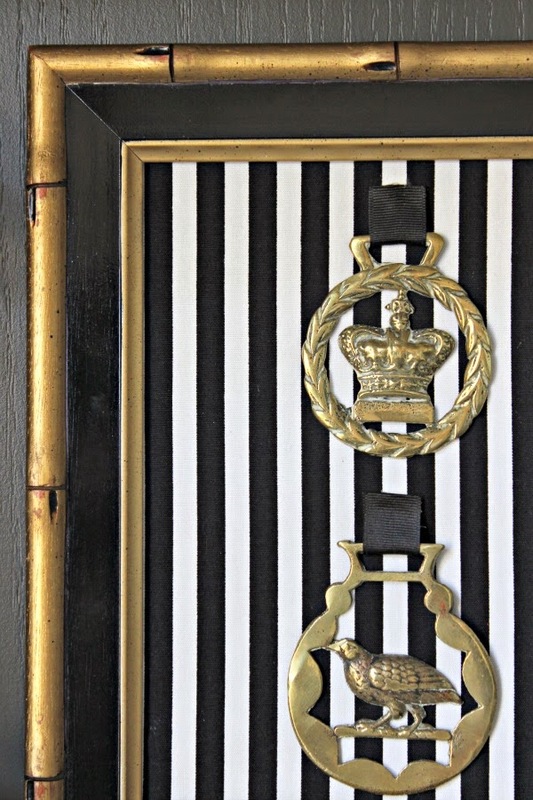 That is such a neat way to enjoy them through the years, and the black and white striped fabric is fun with the gold! Jennifer, this is so sweet and sentimental! I love Cath Kidston and that tea towel is beautiful. I love how you displayed your ornaments, too! The black and white makes them pop. 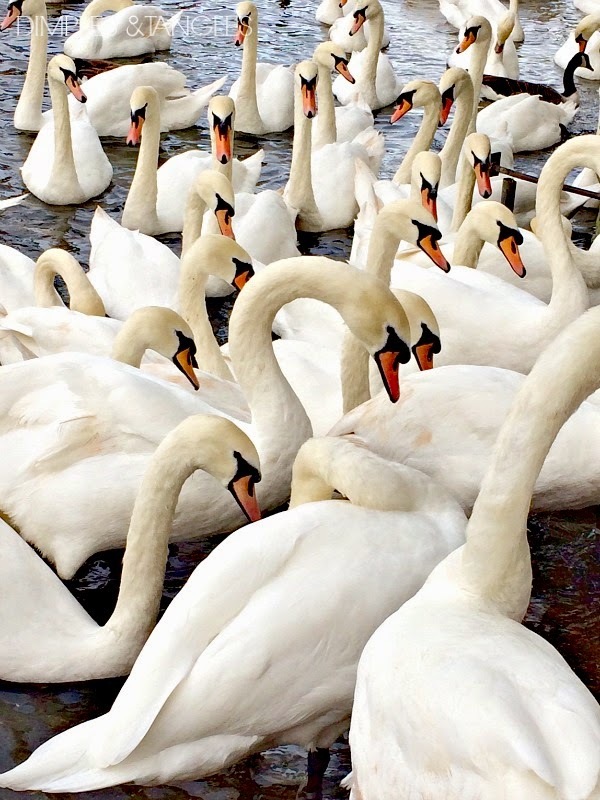 When we visited England, we couldn't stop taking photos of the swans either! Makes me miss it. I love how you have displayed the saddle ornaments. Great memory of your trip. Absolutely gorgeous reminders of your trip. What great finds! I love how you displayed those brass ornaments. I'm definitely adding London to my list of places I'd like to visit one of these days! I love having momentos from trips mixed in with my decor. Love your great ideas for displaying them! I buy only items that hold special memories of the locale, the people, their customs, etc. I like the brass ornaments and of course, the display with the black, white & gold. I love all of your finds!! Such lovely additions to your home to remind you of what sounds like a lovely trip! I agree the word Charity is much better then thrift! And what is it about birds and diamonds? A parrot tried to eat my diamond earing, strange! I love your little treasures! Meaningful souvenirs (and decor) are the best! I love what you did with the saddle ornaments - I will totally be stealing that idea with some things of mine!! I love reading about the treasures you bought home with you on your trip!! 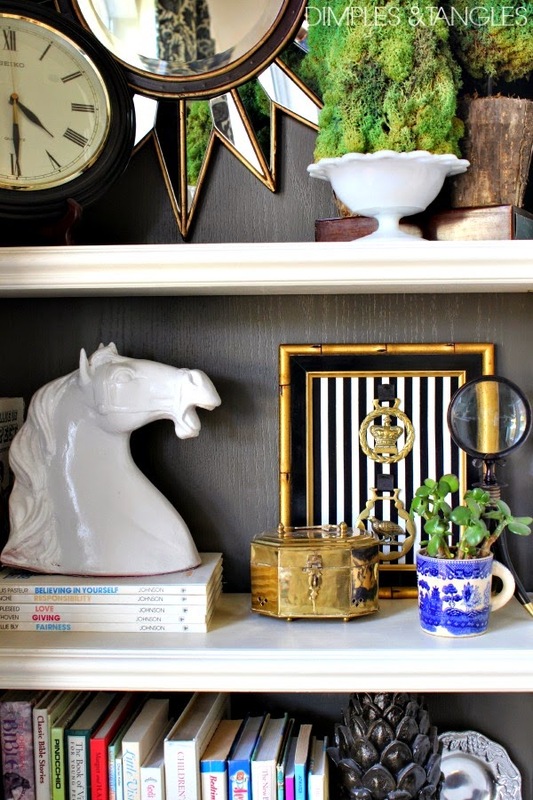 I love the brass saddle ornaments you bought home with you and how you displayed them in such a sweet and thoughtful way.